As a kid, I loved Mad Magazine. One of Mad’s features was “Snappy Answers to Stupid Questions,” which is superficially what Randall Munroe’s new book resembles. It’s every bit as funny as I used to find Mad Magazine, but it’s snappier. Think of it as a supremely geeked-out Mad, the kind of humor TV’s Big Bang Theory would be delivering if those writers weren’t just glossing a traditional rom-com structure with science jargon window dressing. What If? is a book you’ll want to buy a few copies of – one for yourself, the rest for everyone you’ll give it to. 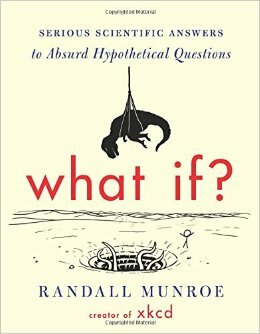 Munroe’s full title is “what if? Serious Scientific Answers to Absurd Hypothetical Questions.” A disclaimer states, “Do not try any of this at home. The author of this book…likes it when things catch fire or explode, which means he does not have your best interests in mind.” In his introduction, Munroe writes, “They say there are no stupid questions. That’s obviously wrong…But it turns out that trying to thoroughly answer a stupid question can take you to some pretty interesting places.” Interesting is right – this is one of those addictive “Did you know?” books, whereby the reader annoys his family every thirty seconds or so with another fascinating tidbit. Put this delightful piece of brain candy on your Christmas shortlist. Or just get it now. Posted in Books and tagged Book Reviews. Bookmark the permalink.